• 12Ft total length for extra reach • Made for iPhone ( X / 8 / 7+ / 7 / 6s+ / 6s / 6+ / 6 / 6SE / 6c / 5s / 5 ) • Made for iPod ( Touch 6th Gen / Touch 5th Gen / Nano 7th Gen ) • Made for iPad ( 6th Gen / 5th Gen / 4th Gen / Air 2 / Air / Pro Mini / Mini 4 / Mini 3 / Mini 2 / Mini / Pro ) EKA-10SC Apple Sync & Charge Cable works on all apple devices compatible with Lightning USB Charging. This Charge & Sync cable has a 12ft total length for extra reach and designed for quick charging. Package Includes: (1) Lightning USB iPhone Charge & Sync Cable (12 ft) ..
• 12Ft total length for extra reach • Made for Micro-B phones (Samsung, HTC, LG, Motorola, etc.) • Made for Micro-B tablets (Samsung, Kindle, Hauwei, Asus, etc.) • For other Micro-B devices (cameras, headphones, powerbanks, etc.) EKA-11SC Micro-B / Android Braided Sync & Charge Cable works on all devices compatible with Micro-B USB Charging, such as: Androids, Tablets, Power Banks eReaders, Cameras, Headphones, and more! 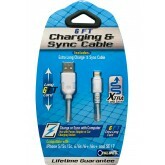 This Charge & Sync cable has a 12ft total length for extra reach and designed for quick charging. Package Includes: (1) Micro-B USB / Android Charge & Sync Cable (12 ft) ..
• High output (2.1 Amps) Wall and Car Charger for fast charging • Made for iPhone ( X / 8 / 7+ / 7 / 6s+ / 6s / 6+ / 6 / 6SE / 6c / 5s / 5 ) • Made for iPod ( Touch 6th Gen / Touch 5th Gen / Nano 7th Gen ) • Made for iPad ( 6th Gen / 5th Gen / 4th Gen / Air 2 / Air / Pro Mini / Mini 4 / Mini 3 / Mini 2 / Mini / Pro ) EKA-310C Apple 3-in-1 USB Rapid Charge Kit works on all apple devices compatible with Lightning USB Charging. This kit covers all your charging needs from home to the car. 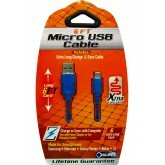 Both Chargers have state-of-the-art USB Ports designed to automatically control the flow of current. This protects against damage to the battery due to overcharging. Package Includes..
• Early Warning Failure Detection for Batteries AND Stator Units • Digital Voltage Display also reads the output of vehicle battery • Automatically adjusts current to avoid overcharging devices • LED lit USB ports make plug-in easier in low light environments • Intelligently concentrates a higher flow of current to the device that needs it most Check out the Affilliate video from Heartland Dual Sport! Our Product vs. the competition! Links to Heartland Dual Sport: &nbs..
• High output (2.1 Amps) Wall and Car Charger for fast charging • Made for Micro-B phones (Samsung, HTC, LG, Motorola, etc.) • Made for Micro-B tablets (Samsung, Kindle, Hauwei, Asus, etc.) • For other Micro-B devices (cameras, headphones, powerbanks, etc.) EKA-311C Micro-B / Android 3-in-1 USB Rapid Charge Kit works on all devices compatible with Micro-B USB Charging, such as: Androids, Tablets, Power Banks eReaders, Cameras, Headphones, and more! This kit covers all your charging needs from home to the car. Both Chargers have state-of-the-art USB Ports designed to automatically control the flow of current. This protects against damage to the battery due to overcharging. &nb..
• High output (2.1 Amps) Wall and Car Charger for fast charging • Made for USB-C Phones (Samsung, HTC, LG, Motorola, etc.) • Made for USB-C Tablets (Samsung, Nokia, Asus, etc.) • For other USB-C devices (cameras, headphones, powerbanks, etc.) 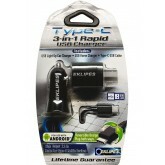 EKA-312C Type-C / Android 3-in-1 USB Rapid Charge Kit works on all devices compatible with Type-C USB Charging, such as: Androids, Tablets, Power Banks, eReaders, Cameras, Headphones, and more! This kit covers all your charging needs from home to the car. Both Chargers have state-of-the-art USB Ports designed to automatically control the flow of current. This protects against damage to the battery due to overcharging. ..
Our New EK1-109 EKLIPES™ Chrome Viper Power Socket System is one of our Newest Motorcycle Cellphone & GPS Adapters on the Market today! This system is ready to go and completely compatible with most 12 Volt Battery Chargers, Cellphone Chargers, Radar Detectors, GPS, Air Pumps, Compatible Heated Clothing and Motorcycle Battery Chargers. 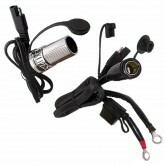 This package comes complete with a 12 Volt Chrome Viper Power Socket with a 3 Ft 6 inch length wire, SAE Dual Pin Quick Connector Plug that plugs into our EK1-153 EKLIPES™ 2000 Amp EZ Jump-Start Battery Harness with a 2 Ft length wire, Waterproof Caps, a 15 Amp Fuse Link, and a 12 Gauge Female BMW Style Jumper Plug (Capable of Handling over 2000 Cranking Amps!) the Harness also works on our EK1-115 EKLIPES™ Bike-2-Bike Plug-In Un..
Our New EK1-108 EKLIPES™ Black Viper Power Socket is one of our Newest Motorcycle Cellphone & GPS Adapters on the Market today! This system is ready to go and completely compatible with most 12 Volt Battery Chargers, Cellphone Chargers, Radar Detectors, GPS, Air Pumps, Compatible Heated Clothing and Motorcycle Battery Chargers. 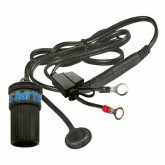 This package comes complete with a 12 Volt Black Viper Power Socket with a 3 Ft 6 inch length wire, SAE Dual Pin Quick Connector Plug that plugs into our EKLIPES™ 12 Volt Battery Harness with a 2 Ft length wire, Waterproof Caps, a 15 Amp Fuse Link. 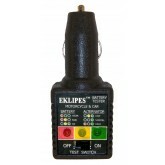 Note: The EK1-109 Chrome Viper 12 Volt Power Socket in this package is also compatible with our EK1-153 EKLIPES™ 2000 Amp EZ Jump-Start 12 Volt Battery Harness, EK1-161 EKLIPES™ Chro..
Our Patented EK1-139 EKLIPES™ Battery & Alternator Tester is the most convenient tester on the Market today with a Dual Bank Chip Set that allows you to instantly test your battery’s charge level on one bank, and your alternator or charging system on the other bank! 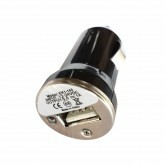 Plug directly into any 12 Volt Cigarette Lighter or 12 Volt Power Socket and flip the On/Off Switch to the “On” Position on the Tester. Then Turn your Key to on Position and the Tester will instantly test how well your battery is charged on Bank 1. Then Turn your Key again to start your Motorcycle or Automobile’s engine and the Tester will instantly test how well your alternator or charging system is working on Bank 2. Package Contents • Battery ..
Our New EK1-145 EKLIPES™ 12 Volt USB Adapter simply plugs into any 12 Volt Power Socket and charges mobile electronic devices such as GPS, iPods, MP3 Players, Cameras, Bluetooth headsets, iphones, Androids, Blackberries, Tablets, eReaders, and More! 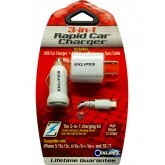 This Unit works great in cars or cruiser bikes and is perfect for those long drives. 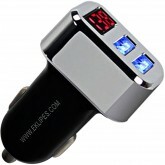 Note: The EK1-145 12 Volt USB Adapter in this package is also compatible with our: EK1-108 EKLIPES™ Black Viper Power Socket EK1-109 EKLIPES™ Chrome Viper Power Socket (See Power Sockets) EK1-110 EKLIPES™ Chrome Cobra Charging System EK1-110B EKLIPES™ Black Cobra Charging System EK1-110BC EKLIPES™ Black Classic Cobra Charging System EK1-214 EKLIPES™ Silver Tank Bag / Saddle .. 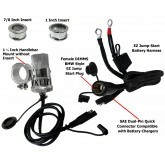 This Bundle Pack includes EK1-109 Chrome Viper Charging System and EK1-161 Adjustable Dual Ring Handlebar Mount Chrome Viper 12 Volt Power Socket for Motorcycles is ready to go and completely compatible with most 12 Volt Battery Chargers, Cellphone Chargers, Radar Detectors, GPS, Air Pumps, Compatible Heated Clothing and Motorcycle Battery Chargers. 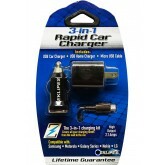 Includes: Chrome 12 Volt Power Socket with a 4 Ft wire length and SAE Dual Pin Quick Connector that plugs into EK1-153 EKLIPES EZ Jump-Start Battery Harness. Also Includes: EZ Jump-Start 2 Ft Battery Harness with 15 Amp Fuse Link, waterproof caps, SAE Quick Connector that works on all conventional Battery Chargers, and 12 Gauge Jump Start Plug compatible with EK1-125 Bike-2-Bike Jr. EZ Jump-Start Kit. EKLIPES Chrom..